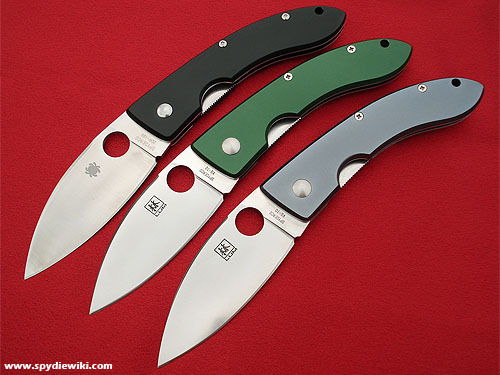 The C65 Bob Lum Chinese folder introduced in late 2000 is one of Spyderco's most applauded designs. The knife initially was made in three different versions, and at least one prototype of this knife also exists (Cranberry PE, originally a color test) that are privately owned by a collector. There also exist a picture of a lot of Spyderco prototypes where there is a bare aluminum version, although this probably stays with Spyderco in Golden. Today there exists also a version with a black handle and ZDP-189 blade introduced in a 2008 Sprint run. The original green C65 can be found in the 2001 catalog available for download here. It can also be found in the 2002 and 2003 Spyderco catalogs. Bob Lum, Based on a traditional chinese design. 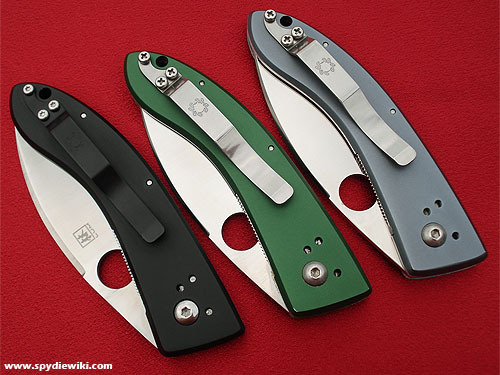 The Rumours about the Black Spyderco Lum Chinese folder emerged in 2005, and generated quite a fuss. It's release was then planned for 2006, but due to onknown factors this didn't become available until the fall 2008. Comments on the Blue Lum in the Spyderco forum. "Designed by Bob Lum the C65 has a definite asian flair. The leaf-shaped blade is flat-ground and made of VG-10 Stainless. We've matched it up with an imperial green almite covered handle"
"The Spyderco C65 Bob Lum Chinese Folder has a blade is tapered like a leaf, broad, flat and razor thin along the edge. This venerable leaf-shape has been around for centuries found on serviceable everyday cutting instruments in China. It’s a definite winner for general utility, hunting and tactical applications. The C65 has a 3 5/32 inch 80mm) flat-ground (blade made of ZDP-189 stainless steel. Matched up with a black Almite coated aluminum handle, it’s hard to say which reigns supreme, performance or eye appeal. The handle’s curvature ergonomically fits your hand for precise performance. A nested LinerLock enhances lock strength, granting peace of mind when really muscling down on a cut. The pivot pin is eccentric and adjustable for wear. Overall weight is 2.6 ounces (779 grams). The Chinese Folder is a high-tech version of a time proven design. 183mm. 108mm. 80mm. 74mm. 12mm. 3mm. 77g. 7 3/16" 4 1/4" 3 3/16" 2 15/16" 15/32" 1/8" 2.75oz. ↑ The ended auction can be seen here. This page was last modified on 21 March 2018, at 20:16.